As I am sure you know we have a 3D printer. We have a Makerbot Replicator II at the office. But we also have a TAZ 6 which I have at my home office. Whilst the company does not (yet) do a lot of contract 3D printing, we have found them useful in the business from time to time. The jobs we have done are quite diverse! Some jobs are better on the TAZ 6 but most are done on the Makerbot. Here, I have tried to hone my skills in design and printing using a 3D printer with the side effect of my grandson getting some interesting toys and learning aids. These skills mean we can consider a 3D printed part in the next FireBrick even, something we would not have done if we did not understand 3D printing I expect. Only this week, my grandson got a wooden train set to play with, but found the bridge sections simple fell down as nothing was there to hold them in place. Within around half an hour I had designed and printed a clip to hold in place. It really is quite an amazing world in which we live. It is amazing the world he is growing up to, where this sort of thing may be really "normal"?! Yesterday, whilst printing something, I heard a crack, and then another. I then realised the print was not working. It took me a moment to spot, but a part on the printer had snapped and was coming apart. 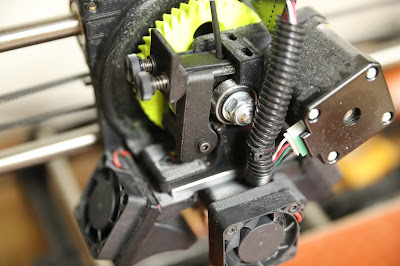 The broken part is the idler which holds a bearing which applies pressure to the filament as it passes a knurled bolt to feed the filament in to the extruder. Without enough pressure the filament does not feed properly. So I googled, and found the part on-line, and loaded it to print. It nearly worked - printing on the broken printer, but sadly in the end the part finally came completely apart. What a lot of people do not realise is how many parts of the typical 3D printer are actually 3D printed. Having failed, this is where you realise you do need two 3D printers. I printed a replacement part at work, in PLA (well, Andrew printed it for me). It worked, but I did print another in PLA straight away just in case. Once you have a second 3D printer you can always print spare parts for either printer! I suppose you could have a full set of spare parts pre-printed, but that is sort of having a second 3D printer anyway! My concern was that the original was a much stronger plastic, ABS. I can print ABS (on this printer) but don't have any in stock. I don't know if PLA will last. However, having managed to print one extra spare, I printed one in carbon fibre fill filament. It is very light, but very strong, and slightly soft (sounds like toilet roll when I say it like that). I expect it will not snap. If it does, I have PLA spares. When do you expect the new firebrick to come out? 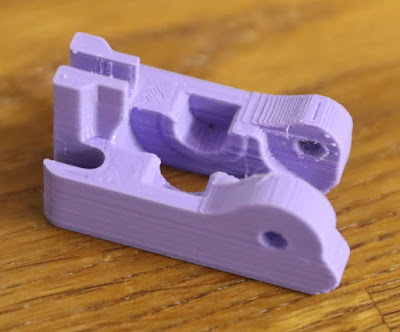 For what it's worth, the idler lever is the Achilles heel of the Prusa/RepRap designs too. The outward force causes it to split at the inside of the pivot, though I've made a slightly improved version by making a curve there to take advantage of the greater strength along rather than between the extruded filament (er, if that makes sense). The better solution is the cast or milled aluminium alternatives available. I was always surprised not two knurled bolts, one each side of the filament... Does that not work?